Approximately sixteen years ago I witnessed a murder, sort of. I don't remember the exact date or time and being that I was in a relatively quiet neighborhood, it never really made the news. Quiet areas like the one I lived in liked to keep things hushed especially if there were thoughts that it could be gang related. I remember walking down the street and past the bar with a new friend I had been hanging out with. Everyone in the neighborhood seemed to know him. We had just had dinner and he was walking me home. I saw a car approaching slowly and made a comment about it. I heard him say "Oh God, turn your head!" I don't remember if I turned it or he did for me. I was pushed and there were loud sounds and everything became fuzzy. I never saw the faces of the people who did it, I only slightly remember the car. I remember the face of one of the men lying on the ground in front of me, and for one moment I saw the life drain out of him. In that moment I saw peace. My friend took me home. I sat on my bed looking at my shoes. There was specks of blood on them. It took a week for the blood to clear the streets. The bar didn't really clean it and until it rained you could see the splatters from where people lay. Every day I went to work I jumped over the spots. I didn't want to look at them. The day before the rain fell I stepped in it. I remember writing "Tonight I stepped in another man's blood." in my journal, then losing the pages sometime later. Over time I put it out of my mind. I went to the bar once years later. The bar was now nicknamed after the murder but no one ever talked about what had happened. I'm not even sure anyone that experienced it still lives there. I remember walking past the area where the bodies lay. My friend asked me if I was okay. We ended up playing darts in the back. Time went on, and I pushed it out of my mind. It wasn't until a conversation about perception and life experiences occurred that I remembered. As these memories flooded back I called Chiron Armand and scheduled a session with him. Santisima Muerte was very present. She helped lead me through a past issue and create an opening or space for it to be rectified. She blessed the new opening/union and asked me to paint her red aspect. While my history with her is long, it's been variable up until recently mostly because I hadn't found people who worked with her traditions and cultural lineage, and I didn't feel I knew enough to fully work with her and show the proper respect. I knew the time would come eventually and so I did what I could until the right time. She was gracious and understanding. She helped me with prison work and protection. Once when I asked her to help me make a decision she alerted me that someone I was dating needed to go. She did this by breaking a candle shaped like her in half while we were both sleeping and the only ones in the house. I found it on the floor by his side of the bed. Within two weeks he was out of my home. A few weeks later I would fully realize why. There's been a lot of articles written about Santisima Muerte in the past few years, many wrought with misconceptions. As my practice is fairly new, I encourage you to seek out a practitioner who has the training and skill set. I will post recommendations at the bottom of this blog. Who is Santisima Muerte? To her followers she is death and an archangel second only to God. 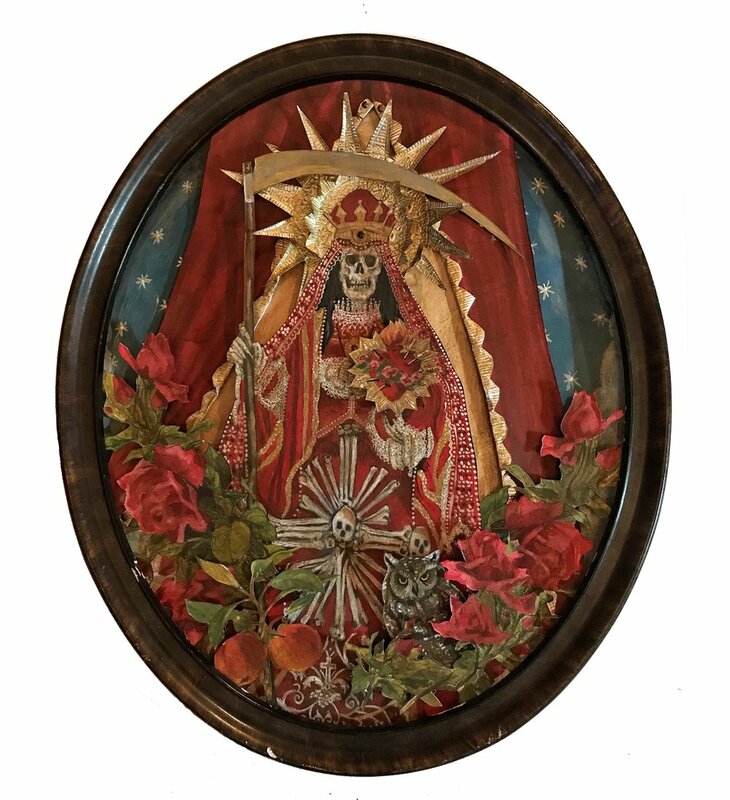 She is a Mexican folk saint typically dressed in robes, with a scythe, an owl, an hourglass, justice scales, and cupping a globe in her palm. She has three aspects: White for peace, blessings, clarity, protection, healing and prosperity; this aspect can also be prayed to for a peaceful death, and represents those who have died the peaceful death such as old age, stillborns, dying in one’s sleep, etc. Red is for matters of the heart and according to some represents those who have died in crimes of passion. Black for Protection, obstacles, spirit communication, and hex breaking; she also represents those who have died violent deaths and can be prayed to for justice or to ease the souls of those departed; this is also the aspect in which some people do brujeria, or negative work. While her appearance, name, and traditions seem Catholic in nature, the Roman Catholic Church has not recognized her as a saint. In 2013, Cardinal Ravasi condemned devotion to her and called the practice "anti-religious". "Religion celebrates life, but here you have death," he spoke. "It's not religion just because it's dressed up like religion; it's a blasphemy against religion." Devotees of Santa Muerte think otherwise. Known as a healer, bringer of love and prosperity, a fierce ally, protector, and a bringer of justice, she is non discriminant and will work with anyone who comes to her no matter who they are or what they do. This is exactly what led me to her in the beginning. As everyone in this life will die, she has a place for all that seek her. The night I witnessed the man die, was the first night I experienced watching death. I had experienced death in my life, friends and lovers died. Pets I had as a child would curl up on my lap as they took their last breath but I had never seen it happen to a human being in front of me. I had a complicated relationship with death for years. A boy I thought I would marry overdosed and passed away on this day March 31, twenty years ago. My cousin overdosed Thanksgiving day seventeen years ago, and for many years I lived a life wondering why I lived and they died. What kept me alive was curiosity. "She responds to the sound salt water creates." Sound travels at about 1531 m/s up to 33 meters per second faster than freshwater at 1450-1498 m/s . The speed of sound in water depends on salinity. Salt water is about 2-4% more dense than fresh water. Its bulk modulus is about 9% greater than that of fresh water. So the higher bulk modulus overpowers the density, producing a higher speed of sound. Santísima Muerte responds to tears both in joy and sorrow. She understands human emotion at its core. The tears you shed in prayer travel quickly to her, and in her understanding she deciphers the best course of action. She acknowledges the inner workings of the heart and mind. In my work with her, the trauma of seeing this man I never knew take his last breath rose to the surface. It took me down a path of deep wounds and wove it's net around them. I thought about this as I painted her portrait. I became afraid I wasn't depicting her right. But as paint hit paper and layers surfaced that fear subsided. I blew smoke against the layers and anointed it in tequila. I crushed roses into the paint until they became fine dust mixed with tears. I hoped that this would depict both the beauty and sorrow. I whispered prayers as I placed the painting into the frame and sent images to my nearest and dearest. Death walks beside us all. If you would like to learn more about building a relationship with her I suggest Steven Bragg's (New Orleans Chapel of Santa Muerte) books. You can purchase them here. You can also visit or contact these temples.